A billboards_impostor_base material is used for impostors. It can be used for project optimization, when Cluster object will be replaced with ObjectBillboards. Material Editor, billboards_impostor_base material, States tab. Deferred - deferred rendering pass. Lerp - enables smooth linear interpolation of sprites when the camera rotates around the object. SSAO - enables the screen-space ambient occlusion effect. SSR - enables the screen-space reflections effect. SSS - enables the subsurface scattering effect. DOF - enables the depth of field effect. Motion Blur - enables motion blur. Sun shafts - simulates visible volumetric shadows, arising when a bright world light source is partially obscured by the object. Diffuse - diffuse texture. To create a diffuse texture for impostor, use Impostors Creator tool. Normal - base material normal texture. To create a normal texture for impostor, use Impostors Creator tool. 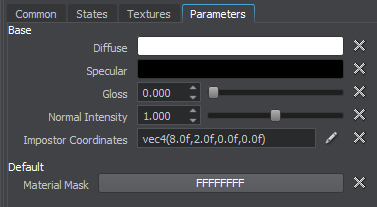 This tab represents parameters available for the material. All of the parameters have set default values, which can be replaced by your own ones. 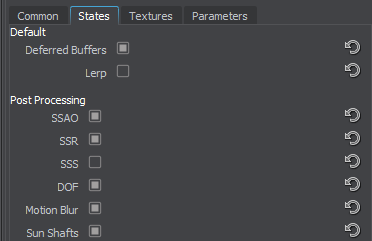 Availability of some parameters can depend on the set States tab values. Diffuse - Diffuse defines the base color of the surface. Specular - Specular is a color picker to choose the auxiliary specular color for the specular texture. It can be used for specifying different specular colors for one texture or modifying the texture color on the spot. The specular color of the texture and this color will be blended. Gloss - Gloss is a coefficient modifying the size of the highlight (Phong shading). Low values imitate wider highlights, typically appropriate to create diffuse reflection from mat surfaces. High values imitate pinpoint highlights, typically appropriate to create uniform reflection of light rays from glossy surfaces. Normal Intensity - Normal is a coefficient to scale the intensity of the normals (provided by a normal map). The higher the value, the higher the normal texture effect is. Impostor Coordinates - impostor texture coordinates transformation. Material mask - a decal bit-mask. If the material mask of the decal material matches the surface material, the decal will be projected.